. Growing up, we've all heard the story of Cinderella, and how a pumpkin was transformed into a magnificent coach. But this is the first time I've heard of a premier turning into a pumpkin, or vice versa, as the case may be. It's October ─ a chill hangs in the air and the last leaves of summer have turned shades of gold and red, dropping in great piles along the streets. And, like Jack Frost, four provincial by-elections nip bitterly at our noses. Many, if not most Albertans, are likely not aware that Alberta's Premier need not be elected in order to remain in power; he may not have a seat in Legislature or carry the responsibility of being accountable to constituents, but ─ if appointed by the Lieutenant Governor ─ can still hold arguably the highest seat in our Legislature. He can remain there, unelected, ostensibly by virtue of his position within the party in power, even despite the line-in-the-sand division between Party and Caucus our government recognizes. Which is why Jim Prentice doesn't actually need to win his seat in the Calgary-Foothills constituency, and why he didn't need to attend the all-candidate debate held there on October 15. He [Prentice] has held almost daily media events since becoming premier, but they have all taken place at planned and highly-controlled events. An all-candidates forum is an uncontrolled environment where Prentice would be forced to engage with his opponents, which could cause potential embarrassment to the new premier. I'm not suggesting that Prentice doesn't want to win, or that he isn't acutely aware of the anger and futility many Albertans would feel should he remain premier without a seat in legislature. No, he knows it's in his best interest, and in the best interest of his party and government, to hold an elected seat; but as we saw during the 2011 Calgary Centre federal by-election ─ during which then-PC candidate, Joan Crockatt, missed her fair share of forums ─ conservative candidates in Alberta don't necessarily feel they need to be present to be seen and heard, or even elected. For a government "under new management", there's more than a whiff of the arrogance and entitlement that saw the end of former premier Alison Redford last year ─ a reputation the Alberta PCs have since attempted to distance themselves from and struggled to shake. Which is why, on Wednesday, October 15, during an all-candidates forum for Calgary-Foothills, a pumpkin took the place of Premier Jim Prentice. Growing up, we've all heard the story of Cinderella, and how a pumpkin was transformed into a magnificent coach. But this is the first time I've heard of a Premier turning into a pumpkin, or vice versa, as the case may be. Pumpkin-themed editorials abound this time of year, from the plethora of pumpkin-spiced foodstuffs to evermore creative and elaborate Jack-o-Lantern carvings. Pumpkins are ─ some might argue ─ the quintessential emblem of the season. But now that this seminal squash has broken into provincial politics ─ alighting a frenzy of social media comments and parodies ─ it's possible this whole by-election nonsense has gone a bit too far. Perhaps it's time to take a step back from the campaigning and politicking and return to what's truly important this October: pumpkin everything. I love autumn, not simply because my birthday falls into this colorful season, but for the leaves; for the crisp, fresh air; and of course, for the pumpkin-flavored goodies. One of my favorite autumn dishes to make is a hearty soup; I make heaps and heaps of warm, creamy soups in a variety of flavors, textures, consistencies and colors. It's the ideal dish to serve on a frosty night, and it freezes easily for those days where you don't have time ─ or can't be bothered ─ to cook. 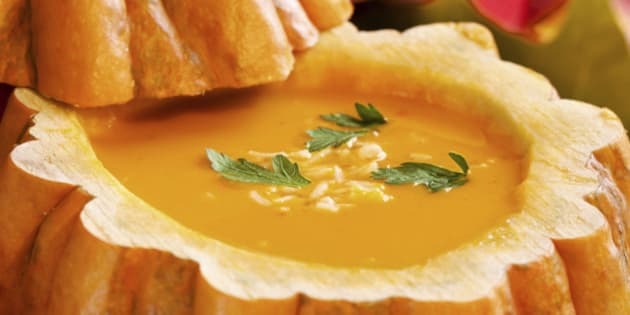 And so, I thought I would offer some respite from the political mire with my twist on the classic pumpkin soup.